The third and final cricket one-dayer between India and Bangladesh was called off without a ball being bowled due to soggy ground conditions here today, dashing India’s hopes of making a clean sweep of the series. The rain can mean different things to different people. For a team that is about to lose a Test match, it can be a godsend, which allows them to save the Test and live to fight another day. In the one-day context, it can mean a sudden change in the equation if the rains have come in the middle of a game, and if rains have caused the match to start late and be a reduced-overs contest, then too it can give a lesser team a better chance of surprising the stronger team. 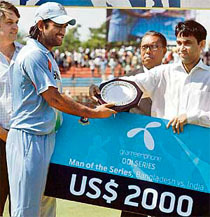 Man-of-the series in Grameenphone ODI series, M.S. Dhoni today said it felt good to be back on the podium after over a year. “The last time I won a man-of-the-series was against Sri Lanka. Its great to be back as the man-of-the-series here. Its been more than a year. It’s a relief too,” Dhoni said while talking to mediapersons after the washout today. Left-arm pacer R. P. Singh will replace injured S. Sreesanth in the coming two Test match series against Bangladesh starting from May 18. The proposed ODI cricket series between Australia and Zimbabwe stood cancelled after the African nation rejected the offer to play at a neutral venue. A top British pathologist has concluded that Bob Woolmer was not strangled, a disclosure that has further strengthened the theory that the Pakistan cricket coach died of natural causes during the World Cup. The BCCI has preferred to adopt a wait and watch policy over the formation of Indian Cricket League (ICL) by Subhash Chandra’s Essel Group which has roped in former captain Kapil Dev and stumper Kiran More on its executive board. A fan of Sachin Tendulkar today pedalled into Bangladesh from the Indian border at Petrapole in North 24 Parganas district to watch the India-Bangladesh Test series. The Army School, here, arranged shooting competitions for boys and girls under the 22 rifle and air rifle shooting events to commemorate the silver jubilee year of AWES. The Indians had to be content with a 2-0 victory margin as ‘Hurricane Akash’ ruined chances of any play at the Bir Sreshta Shahid Nurul Amin stadium, which was completely water-logged due to heavy overnight rain. Hours of hard labour put in by the groundsmen went waste, as match referee Roshan Mahanama declared the game abandoned after the day’s third inspection at 1 pm local time. “The ground is wet. They will need at least two hours to dry the ground. Play is not possible under these circumstances,” Mahanama said. Mahanama, along with the two umpires Ashoka de Silva of Sri Lanka and Bangladesh’s Enamul Haq, earlier inspected the ground at 9.20 am and 12 noon, and postponed the start of the match hoping the conditions would improve. The supersopper was pressed into action repeatedly to dry the ground, as the groundsmen did frantic mop-up operations using buckets and sponges to soak the water. Hundreds of cricket fans stood patiently in the queue for hours to enter the 15,000-capacity stadium but the authorities kept the gates closed as there was uncertainty about the match. Finally, the fans were allowed in only a little before noon. Hurricane Akash, which lashed nearby Cox Bazar and the St Martin island, before moving on to Myanmar, brought rains with the sun shining brightly only at 1 pm ironically the same time when the match was called off. Danger signal number seven, given only in case of a natural calamity of high magnitude, was hoisted in the city from last evening and there were repeated warnings to the public not to venture near the coast. The hurricane’s effects saw two canopies giving way last night, as a overhead plastic water tank also came down. Today’s match was only of academic interest as India had already taken an unassailable 2-0 lead by winning the first match by five wickets and the second by 46 runs. At Chittagong though, it deprived India of going for a 3-0 win, which is what their aim would have been after Bangladesh bundled them out of the World Cup. To Bangladesh, it meant a lost opportunity to pull one back and save face after the huge expectations from their fans, though with so many of their top players being on the sick-list, they were struggling to put 11 men on the field. India would have also loved to have given another chance to Virender Sehwag to see if he has learnt anything at all from his wayward ways, as also to see how Uthappa would adjust after seeing Dhoni and Gambhir do that and play a risk-free game and still maintain a healthy scoring rate. Sehwag seemed to have done all the right things since the early return home from the World Cup. He looked trimmer than before and had spent a lot of time practising with his club team. That showed in the crisp manner in which he hit the ball in both the one-dayers, but his modes of dismissal indicated that where it counts at the international level, which is in the temperament stakes, he had learnt nothing at all. When a player tries to hit every ball for a four or a six without giving a care about his wicket and what his team expects of him, then that attitude betrays a lack of team-spirit and is just not on. If Dhoni and Gambhir could play a waiting game and still score at a run-a-ball, then why can’t Sehwag also do the same? If the selectors show any more leniency, then it would be fair to ask them why such leniency is not given to others. The same is the case with Dinesh Mongia. If ever a player has got chances beyond the usual, it is the left-hander, who has made more comebacks than even Jimmy Amarnath. But then, Jimmy grabbed the chances and went on to become one of India’s top players in both versions of the game. Its time to look ahead now towards building a team for the 2011 World Cup and let Mongia score tons of runs in county cricket, which is about the same standard as our Plate Group Ranji Trophy matches. The most exciting thing about the one-day series was Piyush Chawla. I have to confess I was worried that in the limited-overs game, he would try and bowl flatter and thus lose his most effective weapon, which is flight and loop. He didn’t do that, but showed what a good temperament he had by giving the ball air and luring the batsmen out of his crease, and even when a stumping was missed, he just turned and walked back to his mark and got the batsman in the same fashion next ball. The one quality that separates the Australians from other teams is how they don’t make a drama over a missed opportunity by their teammates. The bowlers just walk back to the mark and bowl the next ball, for they know that mistakes can happen from the best and most experienced too. Young Chawla showed that quality and though its early days yet, one hopes that he will stick to that even as he plays more for India. 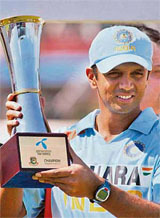 Man-of-the series in Grameenphone ODI series, M.S. Dhoni today said it felt good to be back on the podium after over a year. “The last time I won a man-of-the-series was against Sri Lanka. Its great to be back as the man-of-the-series here. Its been more than a year. It’s a relief too,” Dhoni said while talking to mediapersons after the washout today. Sreesanth was ruled out today following team physio John Gloster’s report that though his left calf injury has improved but still it was not at the rate they had initially anticipated. “Following his fitness test today there are some areas of his recovery that are still not complete. Despite the best efforts at treatment of his injury he will not be 100 per cent fit for the first Test,” BCCI secretary Niranjan Shah said in a release, adding, “Looking at the injury it was decided by the Selection Committee to call back Sreesanth.” He also informed as per Gloster’s report, the young pacer from Kerala will continue to require treatment for this soft tissue injury for another seven days. According to an Australian Associated Press (AAP) report, Cricket Australia (CA) chief executive James Sutherland spoke to his Zimbabwean counterpart Ozias Bvute on the possibility of playing the series at a neutral venue after the Australian government banned its cricketers from travelling to Zimbabwe in protest against the Robert Mugabe regime there. Bvtue, however, shot down the proposal. “Mr Bvute made it very clear that playing the series at a neutral venue was not a possibility. We can now say definitely that the series will not be happening inside or outside Zimbabwe,” a CA spokesman said. Incidentally, Australia would face Zimbabwe in their first match of that tournament. After the Australian government barred the players from travelling to Zimbabwe, CA floated the idea of having the series in South Africa and the South Africa cricket board was also ready to host it. Australian Cricketers’ Association (ACA) said the players could have played at a neutral venue. Both Matthew Hayden and Adam Gilchrist were against touring Zimbabwe but the stumper-batsman said he would like to play the three matches in any other place. With the police yet to make a breakthrough in the sensational case, a Jamaican lawmaker has urged the police to explain the basis of their belief that Woolmer had been murdered and prove it beyond doubt to stop what has become a “global embarrassment” for the Caribbean nation. A report in leading British daily The Times claimed that top British Home Office pathologist Dr Nat Carey has examined Woolmer’s postmortem report, photographs and other materials after which he arrived at the conclusion that the burly Englishman was not strangled, as claimed by the Jamaican police. According to Dr Carey, the death was not from asphyxiation due to strangulation. The original postmortem claimed Woolmer’s broken neck bone strengthened the strangulation case but it was later pointed out that it could well have been a result of Woolmer’s fall. Jamaican newspaper Gleaner claimed the Scotland Yard sleuths, who assisted the Jamaican police in the probe, also believed that Woolmer died of natural cause. “The Scotland Yard report specifically said Woolmer died of heart failure, contradicting earlier reports by the investigative arm of the Jamaica Constabulary Force (JCF) and local pathologist Dr Ere Seshiah, who had conducted a postmortem on Woolmers’s body,” it said. Jamaica’s deputy commissioner Mark Shields has all along maintained that Woolmer had been subdued and then strangled to death in a Kingston hotel on March 18. But the Jamaican police have made little progress in the case, allowing conspiracy theorists a free run. The Times report said Shields was in London last week talking to Scotland Yard and scientists who were asked to look at samples from the coach’s body. 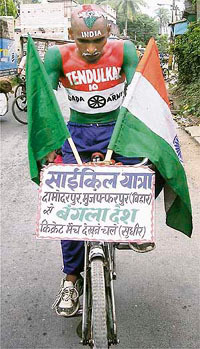 Sudhir Kumar Gautam, who rode a cycle with the Tricolour and the Bangladesh national flag on the handle-bars, told reporters he had met Sachin in Mumbai in 2003 and hoped to meet him again in Bangladesh. “I will watch the Tests from May 18 to 22 and again from May 25 to 29,” Gautam, who has a passport and valid travel documents, said. Gautam, a dairy worker from Muzaffarpur in Bihar, said he had earlier pedalled to Jamshedpur from Muzaffarpur to watch the India-West Indies match at Keenan Stadium in 2002. “I had sought an appointment with Sachin there and the following year I reached Mumbai on my cycle in 18 days from Muzaffarpur to meet him,” said Gautam, who has shaved his hair to resemble the map of India. He said he had also met Sourav Ganguly in Kolkata in 2004 and Virendra Sehwag in Delhi the following year. “I have a personal rapport with them.” He also pedalled from Muzaffarpur to Pakistan in January last year to watch India’s cricket matches. Gautam, who was seen off at the border by cricket enthusiasts, said he had withdrawn his entire provident funds to watch cricket matches since 2002. “Like Abdul Jalil, known as ‘Cricket Chacha’ in Pakistan, I would like to be recognised as the ‘Indian Cricket Brother’ by the BCCI,” he said. The competition was held at the firing range of Patiala Cantonment, here, today. Six Army Schools, including those at Ambala Cantt, Sangrur, Chandi Mandir, Dehra Dun, Dagshai and Patiala, participated in the event. In all, 15 participants displayed their shooting skills. In the individual category (girls) in 22 rifle shooting, the first position was bagged by Diksha Tanwar of Army Public School, Dagshai, and Abhimanyu Singh of Army School, Dehra Dun, among the boys.